Dutch theologian Herman Bavinck (1854–1921) is widely celebrated as a leading divine in the Reformed tradition, and through the ongoing labor of translation teams, editors, and publishers, his vast writings are reaching English readers. This site — HermanBavinck.org — aims to make that access even easier. Here English readers will find a full list of Bavinck’s available works, updates on current translation projects, and a list of books and articles about Bavinck as they are announced. Reformed Ethics (Baker, 2019–). In 2010, Dirk van Keulen announced the discovery of a lengthy manuscript of a previously unknown Bavinck title on ethics, Gereformeerde Ethiek, “a virtually unpublished monograph” hand-written in several notebooks. Keyed into Dutch, the long work of English translation commenced. But in 2012 project editor John Bolt made a further discovery: “the Bavinck manuscript was over 1,100 pages instead of the 560 total that we were working with. . . . Instead of a one-volume work, we are now projecting a three-volume work,” published through Baker Academic. “It is our goal to have the translated and edited volume one in the hands of the publisher by January 2017.” They delivered. Volume one — Reformed Ethics: Created, Fallen, and Converted Humanity — officially launches on May 21, 2019. ••• Reformed Ethics volume 3 of 3, edited by John Bolt. TBD (Baker). ••• Reformed Ethics volume 2 of 3, edited by John Bolt. TBD (Baker). Christian Worldview, a new translation by Nathaniel Gray Sutanto, James Eglinton, and Cory Brock. Due out October 1, 2019 (Crossway). Sacrifice of Praise, a new English translation by Cameron Clausing and Gregory Parker, with a foreword from Scott Swain. Due out June 1, 2019 (Hendrickson). See the 1922 edition here. ••• Reformed Ethics: Created, Fallen, and Converted Humanity, volume 1 of 3, edited by John Bolt. Due out May 21, 2019 (Baker). Philosophy of Revelation: An Updated and Annotated Edition, edited by Nathaniel Gray Sutanto and Cory Brock. Released December 2018 (Hendrickson). Herman Bavinck on Preaching and Preachers, translated and edited by James Eglinton. Released September 2017 (Hendrickson). The Christian Family (1912), translated by Nelson Kloosterman in 2012. ••• Reformed Dogmatics: Abridged in One Volume (Baker, 2011). The original 4-volume work shrunken from 3,000 to 850 pages. Saved by Grace: The Holy Spirit’s Work in Calling and Regeneration (RHB, 2008). Essays on Religion, Science, and Society (Baker, 2008). 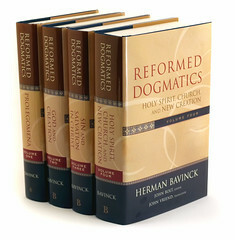 ••• Reformed Dogmatics, Herman Bavinck’s magnum opus in 4 volumes (Baker, 2003–2008). The set has also been electronically formatted by Logos Bible Software. ••• Reformed Dogmatics. Volume 4 — Holy Spirit, Church, and New Creation (Baker, 2008). ••• Reformed Dogmatics. Volume 3 — Sin and Salvation in Christ (Baker, 2006). ••• Reformed Dogmatics. Volume 2 — God and Creation (Baker, 2004). ••• Reformed Dogmatics. Volume 1 — Prolegomena (Baker, 2003). The Certainty of Faith (1903, 1980). Translated into English by Harry der Nederlanden. Purchase the book here ($15) or download a free, though imperfect, version of the PDF here (0.5MB). Biblical and Religious Psychology (1974). ••• Our Reasonable Faith (1956, 1977). Still the best single-volume introduction to Bavinck’s theology. The Doctrine of God (1951, 1977). Christian Education, a summary by Brederveld (1928). The Philosophy of Revelation (1909, 1953, 1979). Read or download the 1909 version of this book for free here. Or through the Internet Archive here. Revised, edited, and re-released in 2018. Calvin and Common Grace (1909). Originally published as a chapter in Calvin and the Reformation. Read or download the 1909 version of this book free here. The Sacrifice of Praise (1908). Read the 1908 translation online for free here. See the 2019 re-translation here. Christelijke Wereldbeschouwing (The Christian Worldview). Dutch version only, this work needs to be translated eventually. See the Internet Archive for the 1904 or 1913 editions. Find the 2019 English translation here. Craig Bartholomew, Contours of the Kuyperian Tradition: A Systematic Introduction (IVP, 2017). A book clearly focused on Abraham Kuyper, but the author so frequently offers a sweeping synthesis of the theological worldview he shared with Herman Bavinck, it’s worth mentioning here. ••• John Bolt, Herman Bavinck on the Christian Life: Following Jesus in Lawful Obedience (Crossway, 2015). A brilliant synthesis of Bavinck’s theology as it applies to the Christian life. The book concludes with “The World-Conquering Power of Faith” (1 John 5:4b), a previously untranslated sermon. Daniel Strange, Their Rock Is Not Like Our Rock: A Theology of Religions (Zondervan, 2015). While not entirely devoted to Herman Bavinck, much of it is (and a fair bit to J.H. Bavinck). The book turns to Bavinck to resolve the question of why non-Christian religions flourish under God’s sovereignty. James Eglinton, Trinity and Organism: Towards a New Reading of Herman Bavinck’s Organic Motif (T&T, 2014). Ron Gleason, Herman Bavinck: Pastor, Churchman, Statesman, and Theologian (P&R, 2010). A full-length biography. ••• Eric Bristley, Guide to the Writings of Herman Bavinck (RHB, 2008). Richard Gaffin, God’s Word in Servant Form: Abraham Kuyper and Herman Bavinck and the Doctrine of Scripture (2008). Jan Veenhof, Nature and Grace in Herman Bavinck (2006).